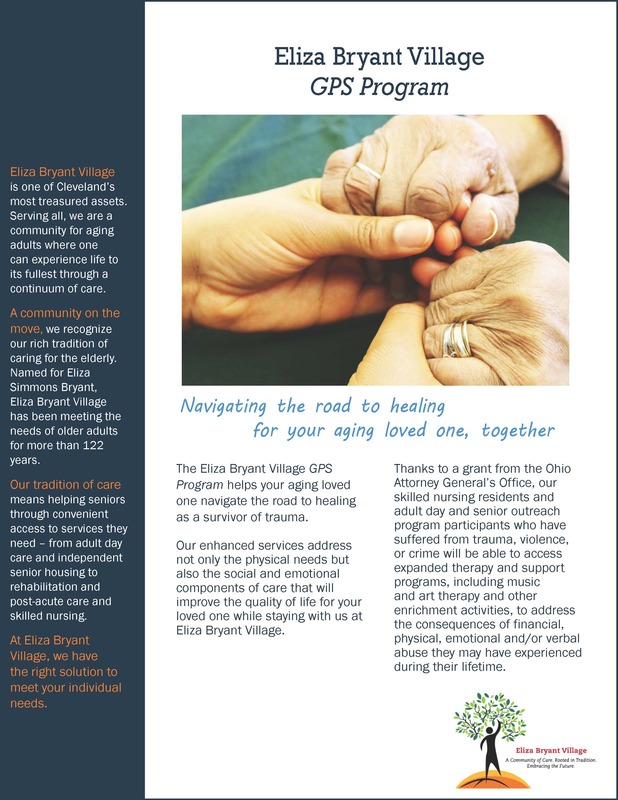 The Eliza Bryant Village GPS Program helps your aging loved one navigate the road to healing as a survivor of trauma. Our enhanced services address not only the physical needs but also the social and emotional components of care that will improve the quality of life for your loved one while staying with us at Eliza Bryant Village. Thanks to a grant from the Ohio Attorney General’s Office, our skilled nursing residents and adult day and senior outreach program participants who have suffered from trauma, violence, or crime during the course of their lifetime will be able to access expanded therapy and support programs, including music, art and massage therapy and other enrichment activities such as pet visits, to help navigate the path to recovery. How will my aging loved one benefit from this program? The services offered through the Eliza Bryant Village GPS Program enhance the quality of life for seniors by creating opportunities for social interaction that reduce isolation, improve relationship building skills between seniors and staff, increase emotional awareness with educational tools and reduce stress by providing enjoyable activities offered from trained professionals. Individuals receiving Eliza Bryant Village’s skilled nursing services and participants enrolled in our Inez Myer Senior Outreach and Adult Day program are eligible to participate in the GPS Program. 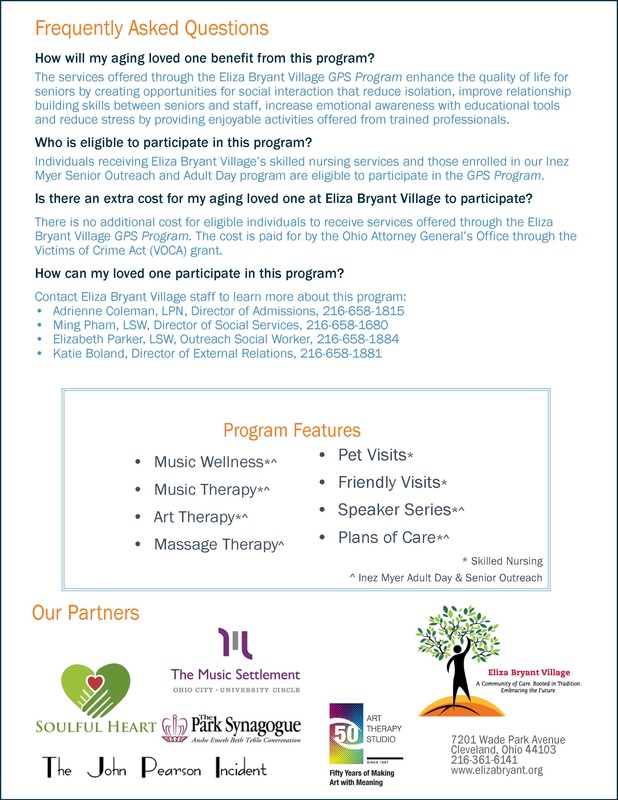 Is there an extra cost for my aging loved one at Eliza Bryant Village to participate? There is no additional cost for eligible individuals to receive services offered through the Eliza Bryant Village GPS Program. The cost is paid for by the Ohio Attorney General’s Office through the Victims of Crime Act (VOCA) grant. How can my loved one participate in this program?